Icon residential designer Craig Ellwood's only project in San Diego: The Bobertz Residence, 1954. Photo: Darren Bradley. Editor’s note: I wrote this article for San Diego Magazine in 2005 as part of its Home Design Quarterly coverage. For an update by current owners and an excellent gallery of photography click here. By Thomas Shess (first published in San Diego Magazine, January 2005). Despite what one historian called an impossible dream, broadcast executive and historian Keith York tackled and succeeded in restoring a one-of-a-kind 50’s home. Craig Ellwood had a bit of showman in him, recounts architectural historian Keith York, the current owner. Ellwood’s career was filled with brilliant work mostly in the Los Angeles area. The famed designer’s Hollywood lifestyle was filled with many flamboyant distractions. So he could be forgiven when he was pleasantly surprised after discovering one of his homes was built in San Diego. The Bobertz House was built in 1954 by Charles Bobertz, a San Diego utilities executive, who drove to Los Angeles for the plans. The San Diego home was part of a series Ellwood called the wall houses. About six were in the series and were influenced by Ellwood’s Case Study projects of the early 1950s. Tom Shess: Where does it rank in your opinion of his residential work? 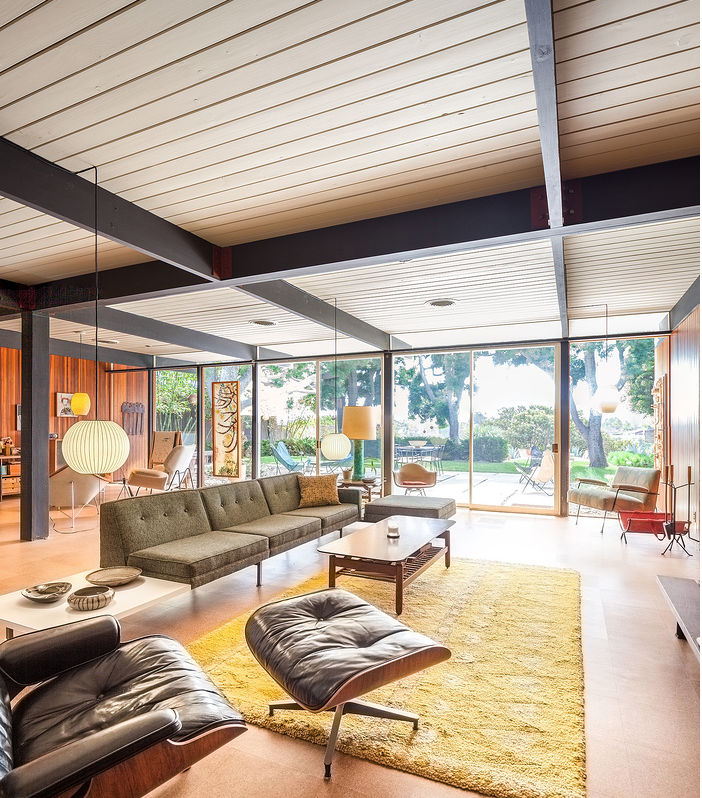 Keith York: The Bobertz Residence was designed in 1953 by Craig Ellwood’s very first employee. Completed in late-55 / early-56, it is the only built project the world-renowned architecture firm built in San Diego. As with many other architects’ careers, the early work’s importance is hotly contested as to how “important” it is. With the relatively small numbers of private residences built by Craig Ellwood Associates across 3 decades, all of his houses are valued highly by owners, architects and historians. This house is significant because it is very early in Craig’s career, part of a 6-project series later titled “Wall Houses” by biographers, only a few of which made the transition from blueprint to built project. Of the few Wall Houses that were built one has already been demolished and another altered (the latter being one of the widely published Arts & Architecture Case Study Houses). Craig’s early houses were smaller in scale than his later designs, and were of a simpler post ‘n’ beam wood construction. My wood home is a rarity in his career, and a cousin to a Case Study House, and Ellwood’s Courtyard Apartments, both of which won him international recognition make this home important. I have been in contact with both of Ellwoods biographers since discovering the house — I ran it by them if it was worth purchasing (one of them told me it from my photographs that it was beyond saving and that it would be a lifestyle change to take on the project). In their research for their books (there are now 4 texts on Ellwood), both historians told me that this project was not in the official archive, they had little information on the project, and only knew from the still-living draftsmen if the drawings were ever completed and the residence built. In discovering the home I have contributed to the knowledge base on Ellwood. Q: Previous owners of note? A: The commissioning client Charles/Chuck Bobertz would later help design/write the Rancho Santa Fe covenant restrictions/guidelines on commercial building in the area. 2nd owner is still alive, living in Del Cerro, not that interested in talking. 3rd owner was the chair of SDSU’s physics department. A: While much of the original design was intact when I bought the home, many of the little furnishings (door knobs, lighting) were in the garage and needed to be sorted. I have filled the home with the same style of furniture, lighting and artwork as the original owners intended. Every piece of furniture I own (aside from my TV) was designed/available at retail in 1956 when the owners would’ve moved in to the home. Every piece of art, pottery, and furniture in my home is vintage — the only reproduction in my home is a rare George Nelson bed that I commissioned a local artisan to recreate. All pottery, paintings and sculpture in my home are by San Diego artists and all are of the era. Q: What attracted you to this home? A: The unusual façade, nicknamed a billboard and a ship by various neighbors over the years, drew me to ask the owner what he knew of the home. The home is within walking distance to 2 of my 3 jobs (SDSU, KPBS). After connecting with the owners I realized the aesthetic and historical value of the home made it much more than a piece of real estate, yet another thing to become overly commoditized in San Diego County. A: The house has been restored to 99% of its original state – I kept one 3rd-owner addition intact. While the house has been restored down to original electricity outlets, door knobs and hinges, I retained a few extra square-feet from a decades-old living room expansion that retains the lines of the rest of the house. I took the house down in square feet to remove additions that were not necessary, nor in-line with the spirit of the house. Losing the square footage has created a bit of a stir among friends and family that see real estate as an investment accounted by price-per-square foot. The only thing remaining is landscape restoration (I have the original 1955 drawings by a widely recognized california landscape architect) and a new roof — both of which I am saving up $ for. Q: The most significant restoration was returning the home’s interior courtyard to its open-roof plan. A: On a personal level--dweller to dwelling what do you like about the house. What are some of its fine points that make it comfortable and satisfying to live within the walls. Living within the walls of the home is like being in a museum, and a refuge from the world simultaneously. I designed the space to be a bit of a time warp away from the rest of the world and it works. From the vintage furnishings, to the art, to the blending of indoor-outdoor spaces and the house positioned away from the street, it is a private place. It is very satisfying to know that on the outside people are confused about the house, enthused about its restoration, while on the inside it is a very empowering, liberating, healthy space to reside in. A: When I purchased the home it was about 2500 square feet. I brought it back to its original 1400 s.f. by removing an addition by a previous owner. Q: Do you entertain a lot? What do your guests like about the house? A: Beyond having SOHO donor events at the home, I have welcomed architects and historians on tours of San Diego, as well as my many friends and colleagues. I entertain at my home more often than anyone I know — a good fresh-juice and vodka cocktail party is very welcoming! To this day (now 4 years of ownership) I give tours of the home to knew visitors, friends and family --- full of queries about how, why, and cost of the project and what it’s like to live here. The questions are of a wide variety, but always from a respectful awe that someone like me could accomplish this by simple means and a lot of passion. A: The house is of redwood and douglas fir post ‘n’ beam construction. The west and east exteriors are a fine-grain sand stucco. North façade and much of the interior walls and courtyard is redwood tongue ‘n’ groove. The remaining interior walls are smooth plaster. The entire south wall is floor to ceiling glass. The house sits on a concrete slab with an Amstrong VCT tile that closely approximates the color and texture of the original asphalt/asbestos tiles. Some flooring is cork as was originally called for. All doors and cabinetry are of phillipine mahogany. HVAC was added to the house a few decades ago and is currently maintained. Paint colors were matched to original stains and plaster colors as the house was painted over completely in the 1960s/70s covering up the original wood grain (though the garage is original). The landscape plan is going to be the next BIG horizon for this house — my plan is to restore the original landscape with much of the original plantings/organization. Another article on the Bobertz House appeared in the San Diego Union-Tribune, September 3, 2006 by architectural critic Ann Jarmusch.